The topic of HR and personnel management is a complex one, especially in bigger companies. Being a human resource manager you need to control lots of processes and operate with organizational hierarchies. You probably use often terms such as a team, talent management, recruiting, synergy, knowledge transfer and value. If you’re mentioning those concepts in your documents, it’s worth to create a visual association, for better readability and audience engagement. 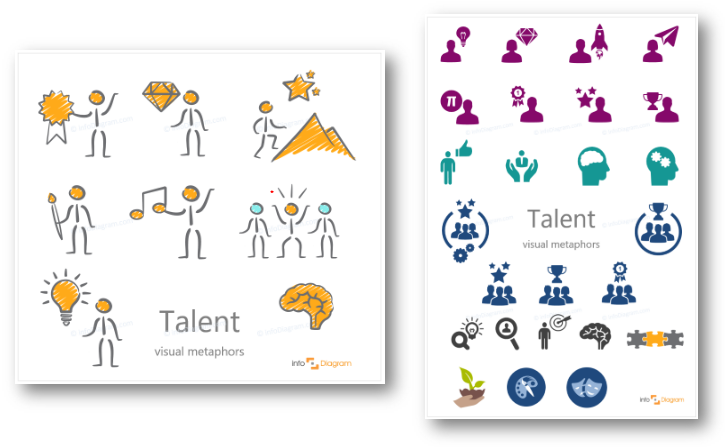 Below you can find a few ideas how to illustrate those HR ideas with simple graphics. To demonstrate these concept ideas, a good idea is to utilize basic icons and diagrams. Some of our favorites are pictured below. Check icon ideas from flat icons collection – suitable for style-neutral graphics fitting to any presentation style or get informal and go for the creative hand drawn symbols. Such a style is more personal and unique. Organization and structure are probably one of the most common HR topics. Hierarchy, teamwork, sections, departments, and processes inside the company are popular issues, which need to be presented somehow. Crucial HR manager’s task is to make workflow and presentations effective and that’s why visualizing ideas is the way the audience will recognize and remember key moments and be better equipped to return your content. Look for particular icon examples in the ‘Presenting Structure or Organization Effectively’. You may have a presentation section about teaching and onboarding new team members. Or you mention education as one of your points. Training, seminars, conferences it’s all about it. More about knowledge concept in ‘Presenting Knowledge in a PowerPoint Presentation’ blog post. Illustrating value as a separate concept can be tricky. The most typical associations are pearls and diamonds, but let’s go further and see how else we can show that something is valuable or should be valued and respected. It can be also an abstract value such as a know-how created by a consulting firm or a wisdom taught by an educational institution. As usual, symbols in two styles: creative and simple flat. More inspiration here: Presenting Added Value. Assistance and service appear often in everyday work. Especially on the first stages of people’s work career. Beyond the diagrams we specifically intended to represent service, you can also combine multiple images to bring to life your specific conceptual needs. Icon examples are in the ‘How to Present Service on a Slide’ blog. Talent management refers to the skills of attracting highly skilled workers, integrating new workers, and developing and retaining current workers to meet current and future business objectives. That’s why we propose using combined pictures like a person, conquering the mountain; icons of people with stars, rocket or bulb near them; three figures in a row with one different colored. Last, but not least 🙂 Interaction, cooperation, harmony and combined effort. If you want to make your team believe synergy is important, use means to attract attention to this idea. Above are our ideas for showing this concept. More synergy and match concept ideas here: ‘How to Present Synergy on a Slide’. So here’s how our designers tried to picture HR core ideas: structure, knowledge, value and performance, service, talent management and synergy. June Bonus – Hundreds of Updated PPT Diagrams & Icons – don’t forget about our June promo, get one package for free.